Welcome to another Roll20 Review, my written and video series in which I review the paid modules available for sale at Roll20. A review copy of the module was provided. Dungeons & Dragons Fifth Edition does a lot of things really well. The easiest to highlight is the Starter Kit intro adventure, “Lost Mine of Phandelver,” first published in 2014. 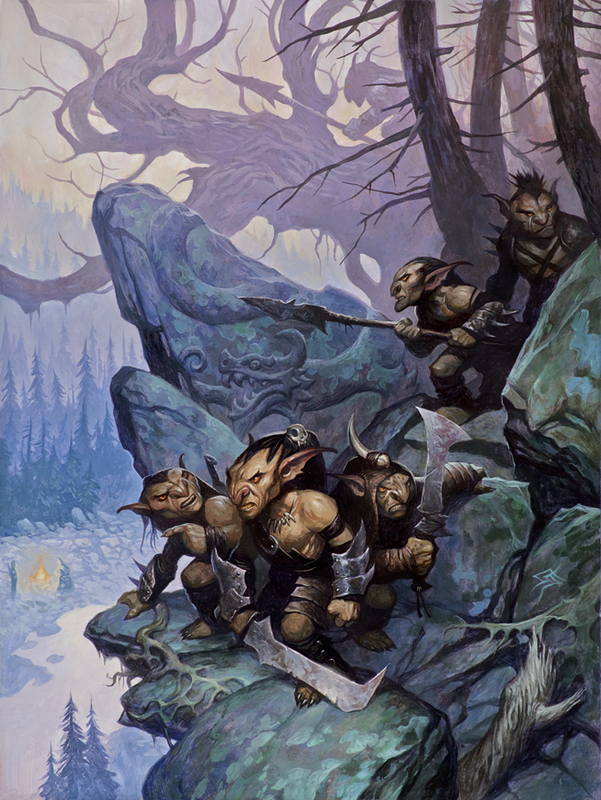 LMoP does an excellent job introducing newcomers to D&D while still providing a memorable and fun adventure full of exotic creatures, locations, and twists. It’s correctly hailed as one of Wizard of the Coasts’ best ever starter adventures. When Roll20 acquired the license to create official D&D 5E modules, adapting the “Lost Mine of Phandelver” was a no-brainer. The adventure includes some annoying challenges to overcome, particularly as it was originally released before basic 5E content we now take for granted, such as the Player’s Handbook and Monster Manual. The Roll20 module fixes most of these issues while providing as streamlined a process as possible to jumping into your first D&D adventure with a virtual tabletop. Those of you who have been following me and my D&D group for the last few years know that we ran “Lost Mine of Phandelver” as our first foray into Dungeons & Dragons Fifth Edition. It wasn’t quite my first rodeo as a DM nor with Roll20, but it was certainly the biggest adventure I’d tackled up to that point. It’s too bad this package didn’t exist back then, because I would have been all over it. 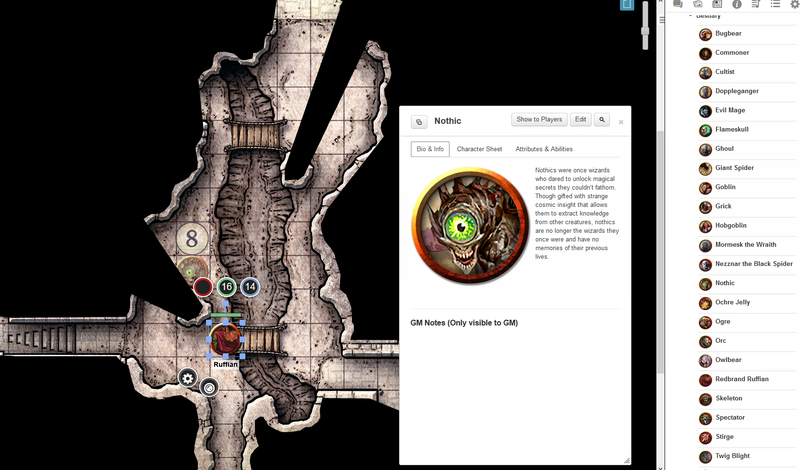 From the very beginning the Roll20 module makes special effort to help newcomers, both to Roll20 and to D&D. For many people LMoP is their first adventure. There are blatant instructions right on the landing page to select ‘Adventure Overview’ from the Journal to get started. The Adventure Overview is a single page that explains the dynamic lighting feature, how to use tokens, and provides an excellent summary of the entire adventure broken down by Acts and maps. The Journal is divided into the four acts outlined in the adventure, which take the players through several different dungeons and areas around the town of Phandalin. Each act has a very lengthy overview that outlines everything that happens (or should happen anyway). Individual areas and dungeons are given separate sections, most with annotated maps. Act 2 is particularly well-organized, providing a nice section on all the important named NPCs in Phandalin, and giving a link to each character sheet. 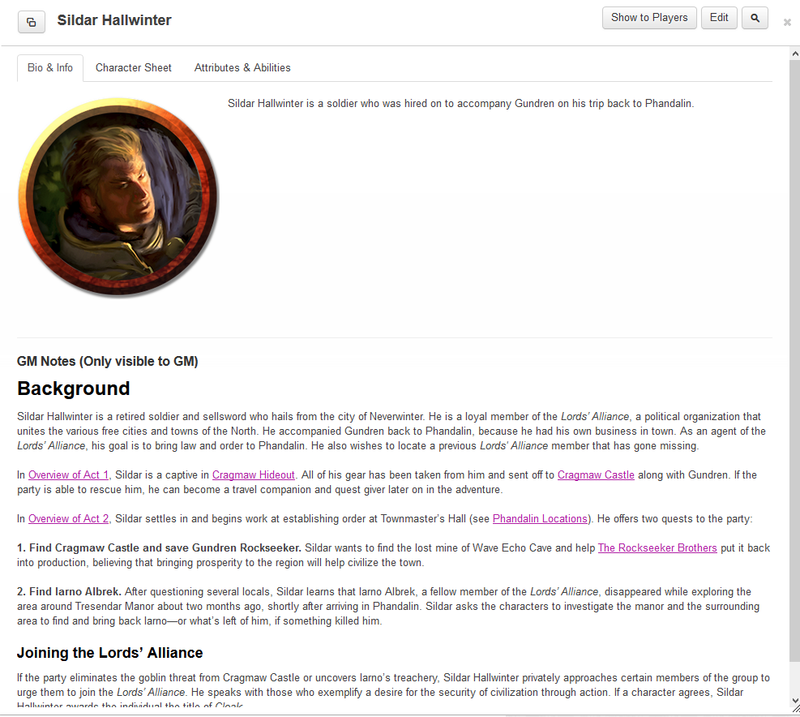 An entire section of Notable NPCs includes full character sheets for every named NPC in the adventure, from important ones like Sildar and Glasstaff to various merchants. There’s actually a bit too much information here. Not every NPC needs their own character sheet, and all of the townsfolks’ are blank anyway, which could lead to some confusion. They really should have been kept as simple text-only handouts. I would’ve loved to seen some more pictures attached to them as well. We do get pics (and tokens) of Glasstaff, Gundren, and Sildar, (the published adventure didn’t have any), but none for Reidoth, or any of the townsfolk. Player Handouts includes images of all the various monsters that you can show your players. This provides a nice close-up look compared to just staring at tokens on the battlefield. There are also some helpful documents on Conditions and a link to the Basic Rules that are free to view from WotC’s website. The DM’s Folder includes all the character sheets for the various monsters used in the adventure, as well as draggable tokens for each one (meaning you can drag them straight onto the battlefield). You’ll find some helpful notes on DMing, how to read monster sheets, a list of magical items, and a note on how to use Rollable Tokens, an intuitive feature that lets you change tokens for shapeshifters. I wish we had picture handouts to go along with the magical items. I know Roll20 has since added full magic item handouts to later, bigger modules like Curse of Strahd. There are pictures of magic items provided in both the original adventure and the Dungeon Master’s Guide, but none here. The five battle maps are directly lifted from the published adventure, with one major advantage: they’ve all been converted to use 5-ft grids (or subsections of a grid). This was primarily an issue with the Thundertree and Wave Echo Cave maps, which was originally drawn with 10-ft grids. Using anything other than 5-ft grids in 5E is a recipe for disaster yet Wizards of the Coast continued to do it for some time with official published material, much to the frustration of those of us running virtual tabletops. There’s two main ways to fix this in Roll20 while still using the original map. You can either subdivide the 10-ft grids, making all the tokens about 1/4 of the usual size, or double the map dimensions, making the map enormous. The LMoP module does the former. It’s not a perfect solution (I prefer the latter) but it makes for an acceptable workaround. Thankfully the maps are high enough resolution that zooming in doesn’t look too bad. Since LMoP is designed as an intro starter adventure, it includes several pre-made player character sheets. The five from the original adventure are recreated here: 2 human fighters, an elf wizard, halfling rogue, and dwarf cleric. Each PC has their unique background that ties them to this specific adventure, which is a neat concept, and one I recommend looking at even if your players want to build from scratch. A handy DM’s PC Guide note keeps track of the role-playing traits and the Passive Perception of each hero. I would add AC of each hero to that list of helpful notes as well. The tokens for these pre-made PCs are right there at the landing page letting you grab and go relatively quickly. The Roll20 module of “Lost Mine of Phandelver” is my instant recommendation for anyone who wants to start playing D&D 5E online. It’s a solid, lengthy adventure and the module faithfully recreates all the maps and tokens you’ll need. You’ll probably want to spend some time tweaking it, particularly with the side quests that lack any maps, but this module is a huge time-saver and a great introduction to Dungeons & Dragons. All battle maps have been properly converted to use 5-ft grids (or subdivided grids). Nicely organized information for DM’s, including a simple guide to the pre-made PCs and how to roleplay friendly NPCs. Easily draggable tokens for each monster. Tokens and pictures for some important NPCs like Gundren, Sildar, and Glasstaff. No additional battle maps for unmapped sections of the adventure, such as Wyvern Tor and Old Owl Well. Phandalin town map should have been GM layered and annotated, instead of placing everything on the token layer for players to see. Sword Coast Map doesn’t need any Fog of War, but it does need the GM layer for places the players have yet to discover. No pics or handouts for magic items. All the zombies on the Thundertree map are supposed to be ‘Ash Zombies’ which grants them an extra ability called Ash Puff. Vyerith the doppleganger is described in a female drow form, whereas her token clearly depicts a male drow. The Verdict: If you’re new to D&D 5e and WANT to play on Roll20, Lost Mine of Phandelver is the single best purchase you can make. A review copy of the module was provided.